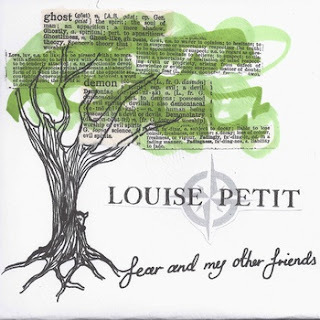 This debut release by Midlands based singer-songwriter Louise Petit is further proof that there is a buoyant and creative scene within the low key music venues throughout the country especially with artists who have the talent and desire to impose their own style on a modern interpretation of traditional music. This five track-recently issued EP has its roots firmly planted in the style of the great American songbook with the simple but effective sounds from an array of acoustic instruments providing perfect synergy with the song construction and writing skills of Louise. The listening journey of FEAR AND MY OTHER FRIENDS may be short but is certainly sweet enough to induce many repeat plays and leave the songs ingrained within your mind. An integral part of the Louise Petit project is the assembling of a four piece band that support her on the road as well as in the studio and help create a sound that has all the qualities of a timeless recording. On all five tracks, Kevin Reginald Cook plays the double bass, while all drum and percussion duties are undertaken by Tim Heymerdinger. Tracks 2 and 3, ‘Ghosts’ and ‘You Loved Me First’, are enhanced by the guitar and mandolin skills of Tom Manning, while, as well as main vocal duties, Louise effortlessly switches between guitar and the subtle sound of the ukulele. Together, they offer a perfect backdrop to the defining gem of this record, the exceptionally well constructed songs. ‘Love is Pure’ opens the EP with a driving back beat to a number that could easily have been lifted out of the song writing alleys of downtown New York with all the show qualities of such songs. The infectious whistling accompaniment aids the flow of the tune and enhances its toe tapping credentials. The following track ‘Ghosts’ has a haunting introduction which evolves into a slower tempo number defined by the quaint tones of the mandolin and the ukulele. The light percussion and dream-like background harmonies lead us into the third track, a sultry number titled ‘You Loved Me First’ where the topic of eternal love is explored. ‘Demons’ is probably the stand out song from this short selection of tracks. The melodious chorus hook of this song has all the features of a Broadway tune with a jazz-like twist. The EP concludes with a tune that is heavily influenced by the strumming sounds of the variety of string-based instruments used and the highest praise you can offer at the end of ‘A Fading Light’ is to wonder how good a further five tracks to convert this into a full length album could have been. Hopefully there are further plans for Louise and her band to return to the studio to record some more material and after thoughtful deliberation, the similarities to the sound being produced by American songstress Nell Bryden comes to mind. Only time will tell if Louise emulates the acclaim and recognition of this fine purveyor of Americana music but all the tools and potential are definitely in place.